Of any project that we have ever done in our home this project made the biggest impact! We built our home a little over 11 years ago so everything was still nice in our kitchen but my taste had changed. 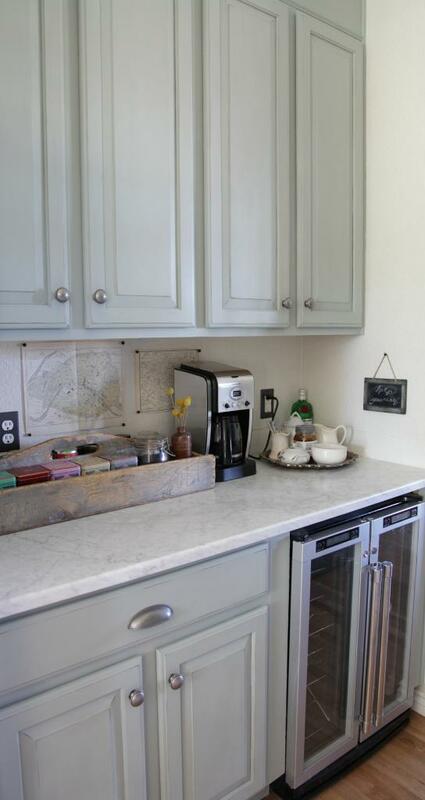 It took me about four years to convince my husband to go along with painting the cabinets. What really sold him on going for it was the awesome instruction we received from Amber and Brad at Shades of Amber. They were amazing at giving us step by step instructions in how to use Annie Sloan Chalk Paint (our step by step instructions will be coming next week). Our island had always been an odd shape and not a great useable space. Because the island had two levels of counters it actually made it hard to do almost anything. 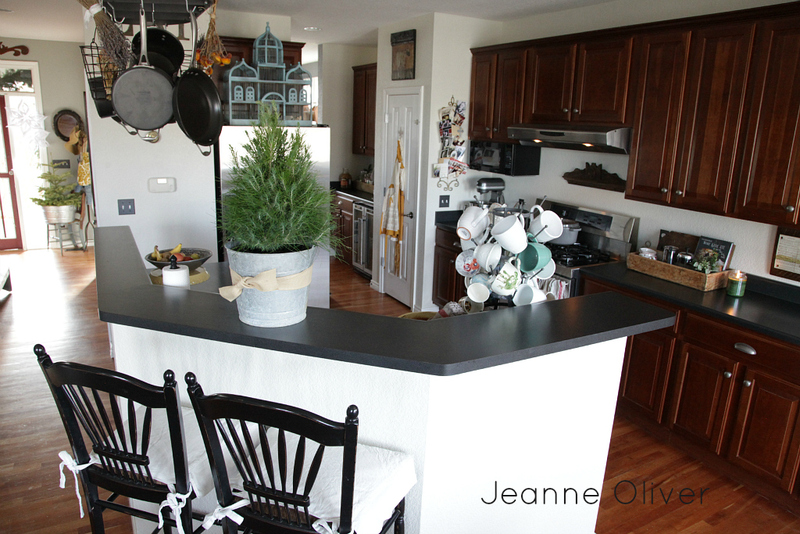 Once we knew we were going to refinish our pre-existing cherry floors and add cherry floors throughout the living room and studio we knew we had to make a final decision about our island. If we were going to change it…now was the time. I really wanted a larger island that would allow for storage, homework, baking and just a nice place to gather round and talk. 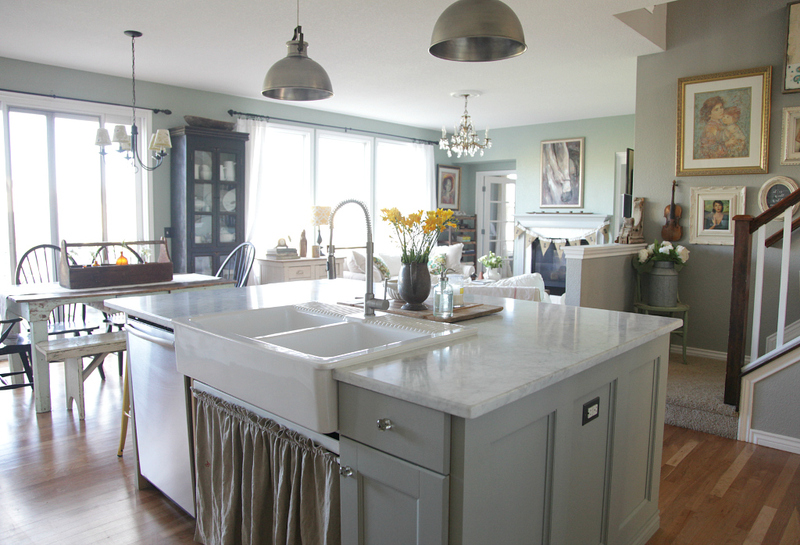 We will be adding a new counter along the back of the kitchen and a back-splash this fall. 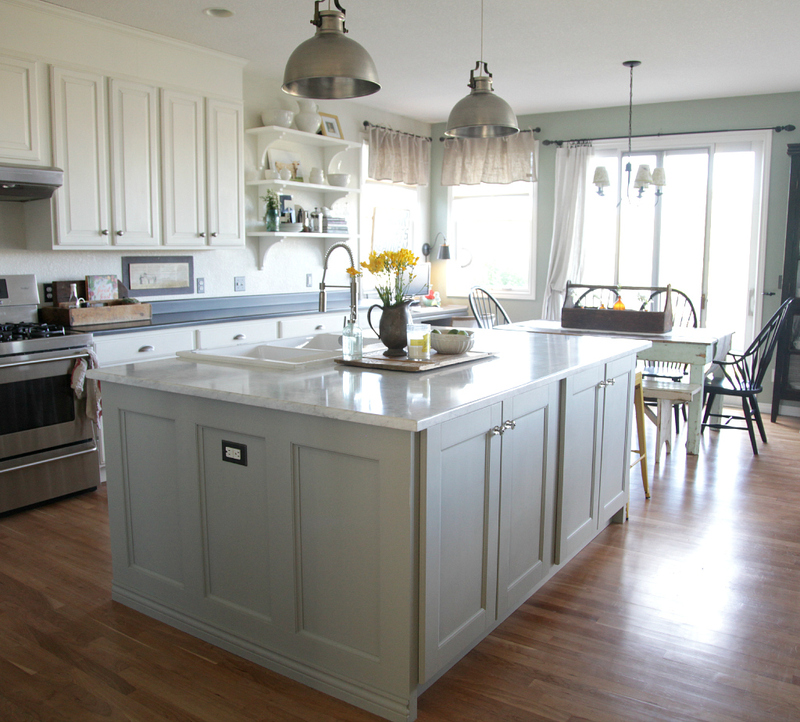 I hope you will join me next week as I show how we built our island and step by step instructions how we painted our cabinets. I have been waiting for your reveal! I love it! Your new island is so beautiful and looks like it is so much fun to use! Pretty paint choices as well. That marble is gorgeous! 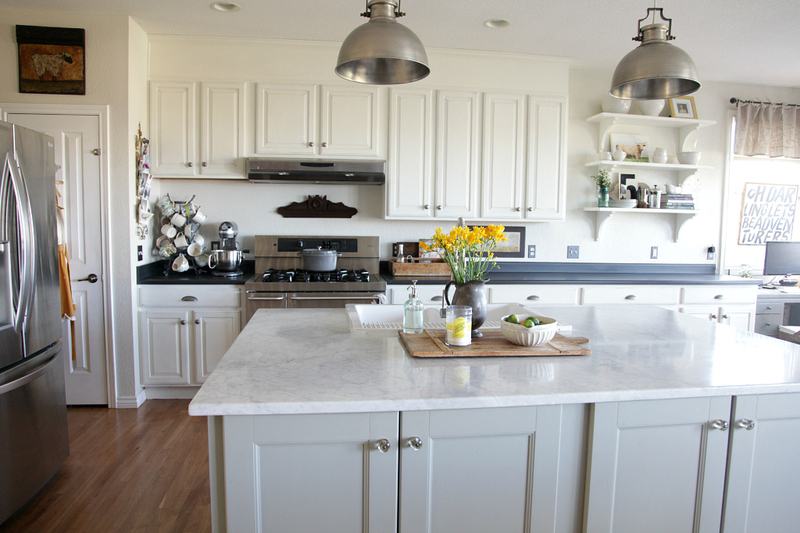 Are you going to redo the rest of the countertops? Where did the microwave go??? I keep looking at the before and after and see SO many more cool things! 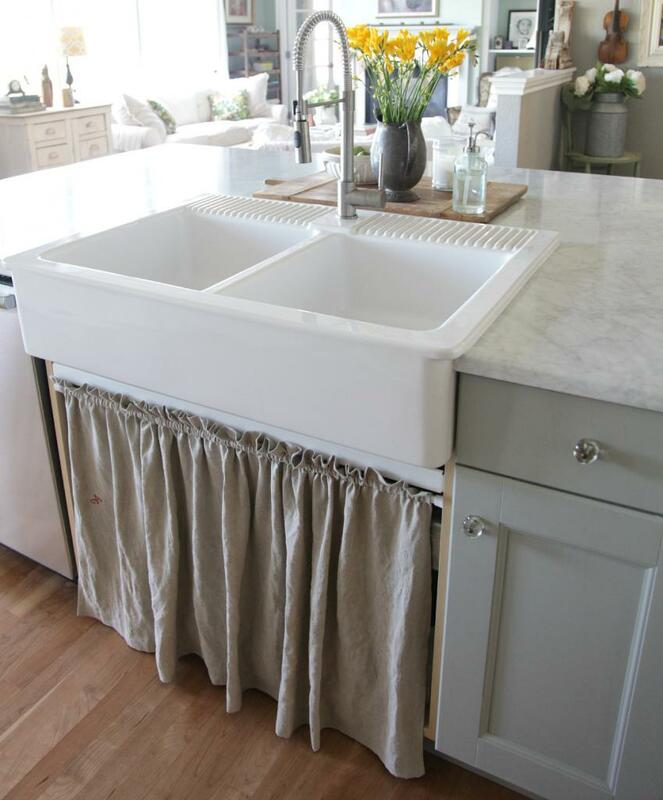 I am in love with that sink too…would love to replace my stainless sink with a beautiful farmhouse sink like this! Beautiful space next spring I am painting out cabinets great job!! 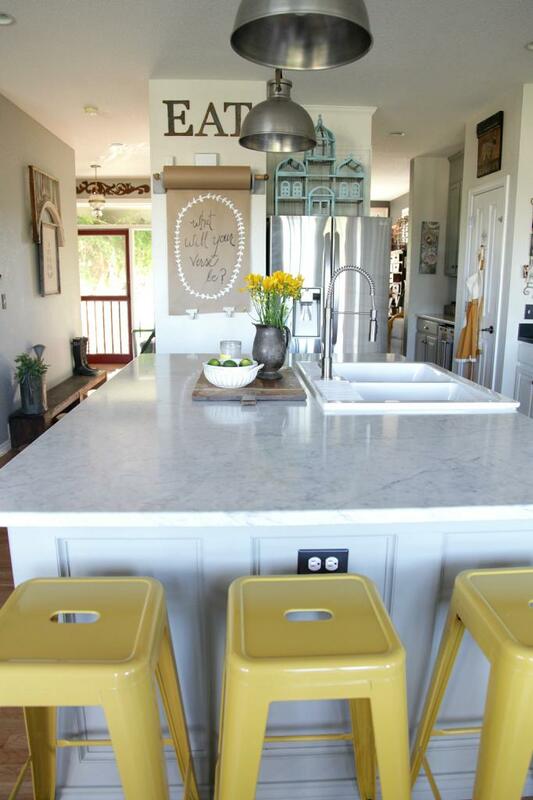 I love what you did with the center kitchen ‘island’. Everything looks so fresh, and open and accessible. The white paint really adds to the openness. It makes it all look more roomy. Oh you painted! 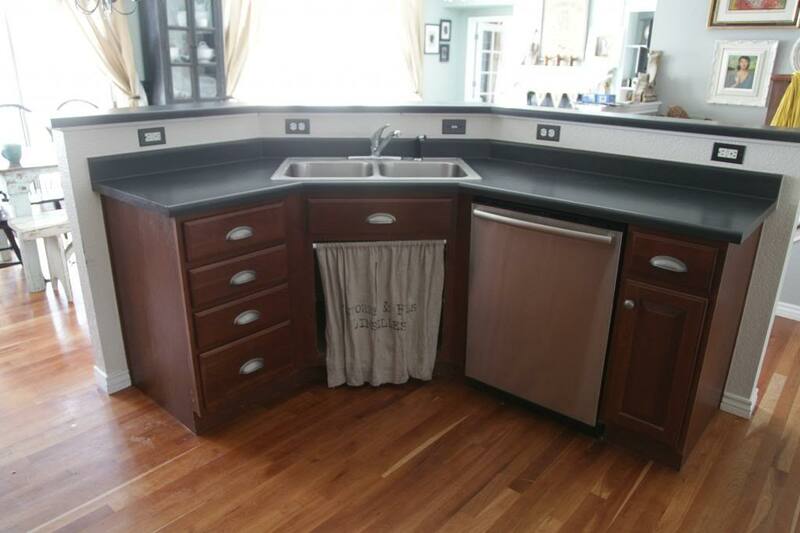 I remember you saying that your hubby loved the stained cabinets. It’s beautiful!! 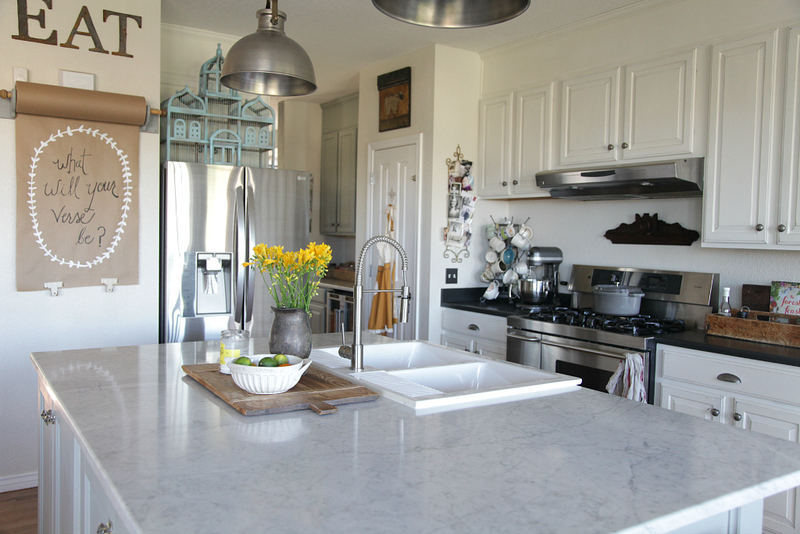 Love the marble and all the perfect little touches. I love it! love all of it! but especially the sink!!!!!! The island is perfect…thanks for sharing…and I’ve said it before but I love the color in your living room. Oh Jeanne, this is just beyond gorgeous! I actually had to scroll through the photos about four times. I just love it! 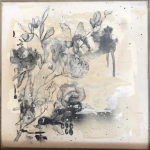 I also can’t wait to hear more about the chalk paint process. 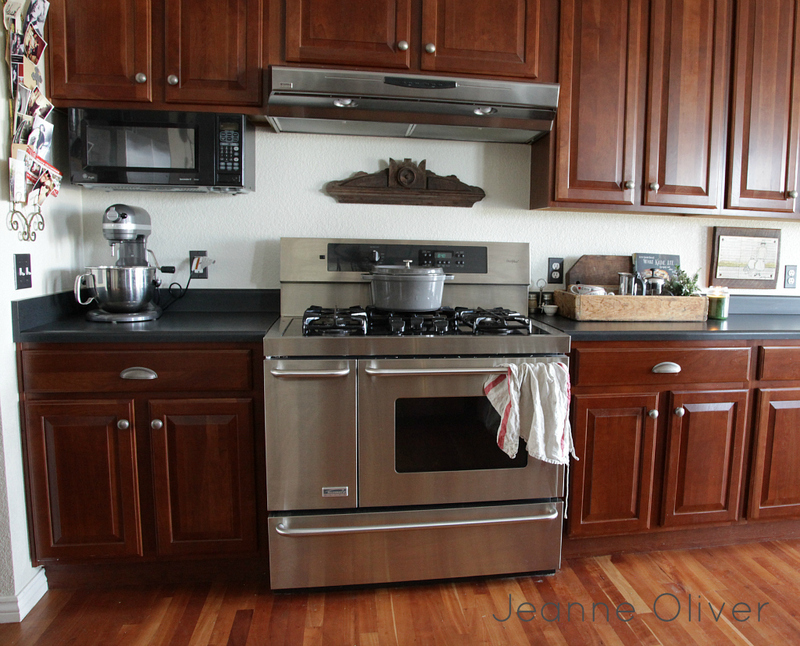 Our kitchen cabinets need some touching up and I’ve actually considered repainting them entirely with chalk paint. I’m so anxious to read what you have to say about it! Hope you are doing well! 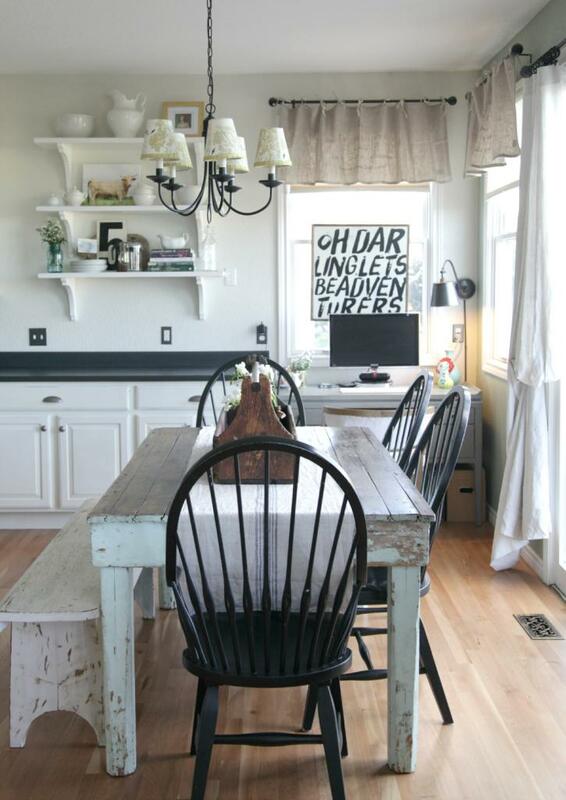 I love this and am considering doing the same to my oak cabinets. 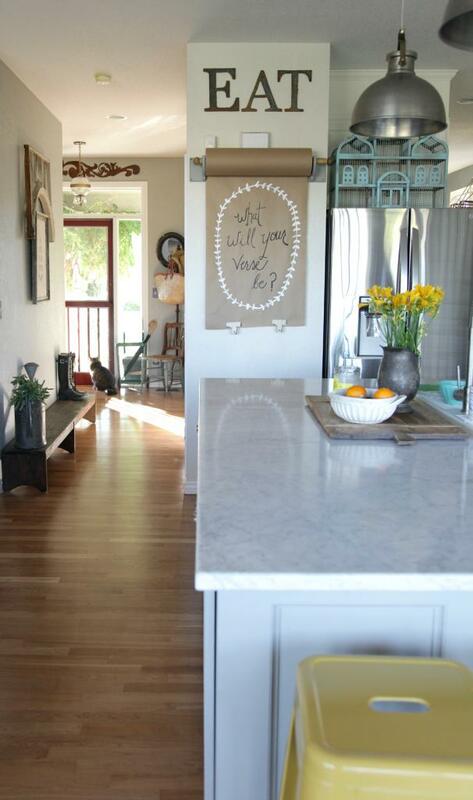 I’m curious however, how much you spent on the chalk paint? I hear it is a bit expensive. I LOVE it so much friend! You have impeccable taste! Wow! I’m usually not one to choose to paint wood, either, but this looks lovely! Like it was meant to be! You had a vision, and it all came together very nicely! We gutted our kitchen about 8 years ago; exactly what I wanted, and it still makes me smile every single time I walk into it. Enjoy! That island!!!!!! 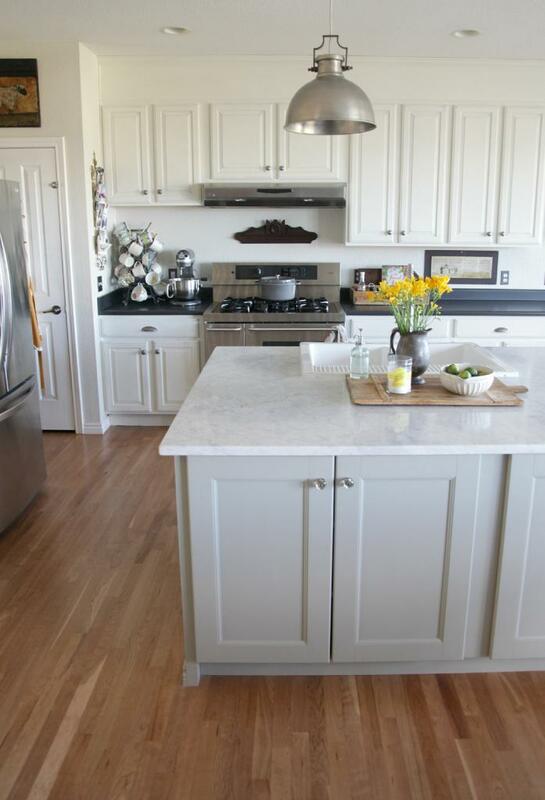 so happy for you to have that lovely kitchen………soooo dreamy!!!! Can’t wait to remodel mine!!! It just turned out gorgeous!!!!!!! Love it, Jeanne! Beautiful transformation. Gorgeous! So light and airy, it looks like your space is even bigger!